Crazy, indeed. While yesterday was pretty quiet courtesy of the UK holiday and the start of the tennis in New York, the rates market couldn't help but rally back a decent chunk of Friday's net loss, with bond futures up a point and a half and the EDZ6/Z8 spread actually closing tighter than it opened on Friday. Sure, there was some data, but generally speaking it was in line if not a scooch better that consensus. You're probably best to file this type of price action as "the market's gonna do what the market's gonna do unless someone proves them wrong." Just because the plot is as hackneyed as that of a Friday the 13th flick doesn't mean the producers won't give it another airing, as we've observed ad nauseum over the past couple of years. 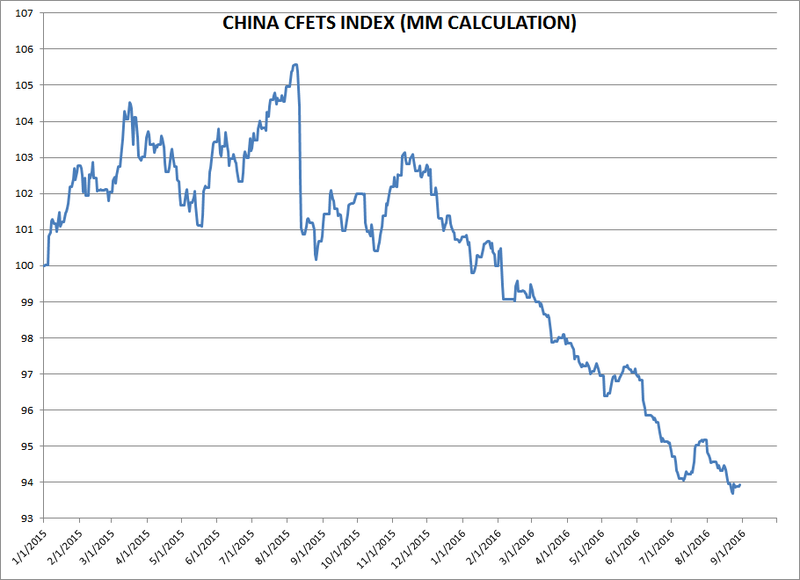 Another constant in recent times has been China's stealth devaluation of the RMB against the reference basket. This has continued apace, and while it the last day or two have seen some respite from the lows you have to squint awfully hard to see it. Still, one does wonder if we are getting to the point where enough may be enough...not necessarily for the Chinese, but for some of the others impacted by RMB weakness. 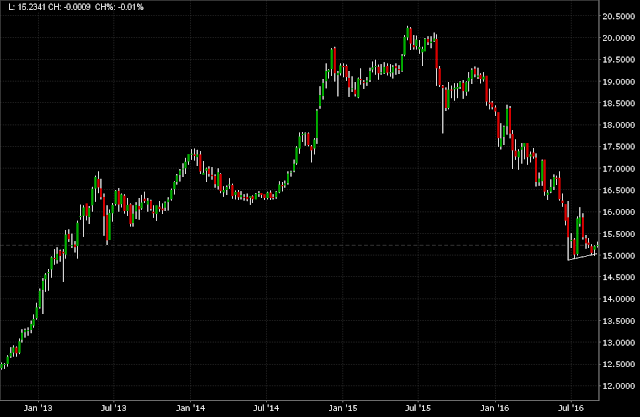 CNH/JPY, for example, seems to have run out of steam to the downside at 15 or so. 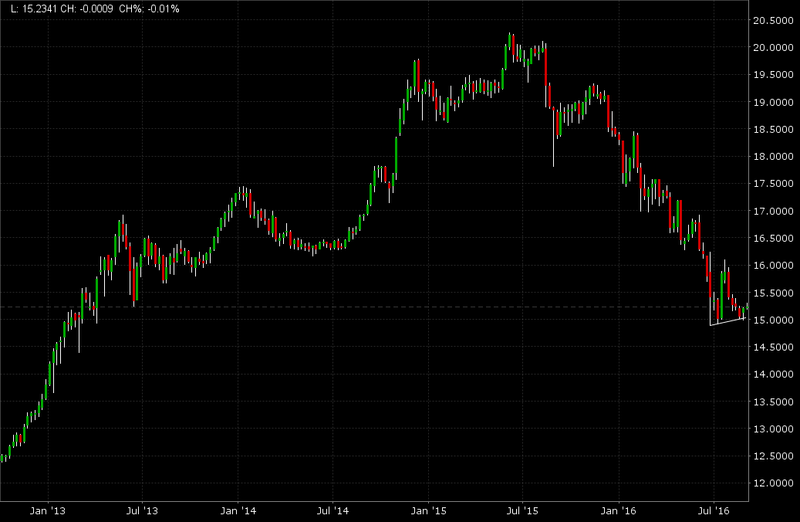 (Of course, one could easily just point the finger at USD/JPY at 100 or so as a higher liquidity equivalent.) Still, if you didn't know what this was you'd have to say that it's trying awfully hard to form a base. At the very least, you know where you are wrong. On a somewhat longer term basis, the cross is down some 25% from its highs. Of course, those highs themselves were the result of currency piss-taking from the Japanese, so are not a particularly useful frame of reference at the moment. In any event, this is a trade that is obviously better to manage via the legs than the cross, but at least confers the benefit of offering a decent bit of carry. 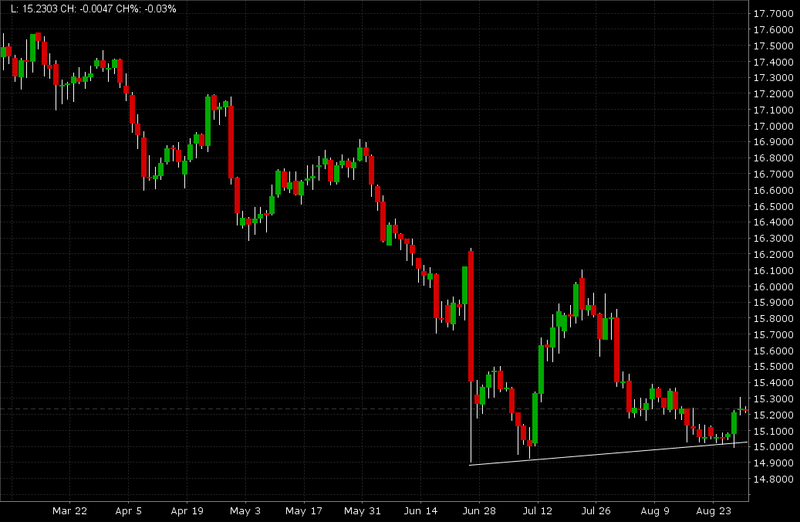 In the short run, it's just USD/JPY with a prom dress on. Yet the fact that this cross looks like putting in a bottom could, at the very least, offer some conviction to anyone steeping into the breach in USD/JPY on the expectation hope that NFP and the Fed do the biz over the next few weeks. Bonds, stocks and gold are now all correlated. Yellen will never meaningfully raise rates again in your lifetime. Kiss goodbye to Global Macro (the worst performing investment class in the last 5 years). A little light on comments today -- is there a holiday I didn't know about? MM- I remember when you first posted that H&S China chart back in March and I asked 'was it a possibility', it now looks like it has played out and this time I will ask,what would it take for it to reverse? Interesting to see the EU fining Apple in Ireland. With the collapse in TTIP (US-EU trade), Brussels is now determined to attack US interests in Europe. Amazon and McDonalds are to be attacked next. The EU are determined to remove low corporation tax from any EU country, the only safe location now for multi-nationals and banks is the UK. Yes, it's quite reminiscent off US regulators using non US banks as their own personal ATM machines for LIBOR and FX fines while much more egregious abuses of market structure in the equity market get the thumbs up...oh, unless you trade Spooz from your mum's spare room near Heathrow, in which case you're fair game. Or like fining VW eleventy bazillion dollars (for admittedly dastardly behaviour)...money that may well go to the next bailout of a crappy US automaker. If you really think that governments should be able to pjck individual winners and losers when it comes to the tax system rather than providing a level playing field....well then move to Connecticut and hold your hand out like noted pauper Ray Dallio. they'll love you here. Oh Macro Man, that is why we love you. I am pinning this to write board in the office. Couldn't agree more. Macro Man ANGRY - GRRRRR……. I think the US should formally start taxing all world citizens for the privilege of being able to live in its world - enough of this backhanded exorbitant privilege and reserve currency BS. Macro Man, not sure you need first part of comment to justify EU action. Apple was avoiding tax, as do many US corporations. They are quite good at it. But I have no problem with EU stopping their game irrespective of how US treats non US corporations (and I kinda think VW got what was coming to it). @flowthrough The first part of the comment was in response to the previous one, which seemed to suggest that the big bad EU was picking on poor little US corps.. As for VW, yes the acted very poorly and deserved to be punished. But compare their fine with the $900 million fine for US national champion GM, which was found criminally liable for knowingly using faulty ignition switches that were tied to more than 100 deaths. Fines seem disproportionate to the crimes IMHO. @Nico, European banks have received the lion's share of the fines thus far from the laundry list of US regulators. Nico, those numbers are irrelevant when looking at LIBOR and FX fines, which I specifically cited. In those two realms, non US banks have received the lion's share of the aggregate penalties from a myriad of US regulators. I think Nico and MM might be talking about different things regarding the fines. The "big money" U.S. bank fines that Nico refers to -- for B of A, JP Morgan, etc. -- are mostly for mortgage-related shenanigans. When it comes to tax let me tell you in my experience there are few innocents to be found. Apple, well Apple or more precisely their accountants, know exactly what they are doing to avoid any meaningful tax bill. The EU commission, they want everybody onboard to play by the same rulebook and frankly most tax regimes really are not set up for that. Ireland , Lux etc none of them want a real level playing field in the tax arena. It just undermines most of their ability to attract external cashflow/investment. The US, can't crib in the slightest until they stop what happens in Delaware staying in Delaware. No , when it comes to tax I don't think I know anyone who wants to actually pay it. They just want the services it pays for and they want them to be paid for by someone other than them. Usually ,when you start looking into these issues of taxation it's pretty much the case of one set of hypocrites bickering with another set of hypocrites over who carries the cost of the free lunch. What is inarguable is this. Tax law is highly complex and it suits goverments that it be so. The less it is understood by Joe public the better , because it's utility value has a political tool diminishes with transparency. Unfortunately, for those same governments it has to be said that a natural consequence of tax law complexity is the opportunity to 'game' it's burden which is exactly what Apple has been doing. Ever since the early post millennium years I've been watching for the time when global corps would become a prime target. I never doubted it would happen. I only wondered how long it would take to happen. once upon a time i organised (Italian) tax arbitrage for French biggest bank - it was a $10bn equity derivatives book which combined with all the other countries in bilateral double taxation agreement with France, helped save hundreds of million of tax year after year. And it was all ARTIFICIAL. i still have hope than one day people in charge of regulating and auditing banks will be as smart as the people targeted. Say, an ex-trader becoming auditor or SEC personel. there is still a massive chance of improvement there, you only need the political will to do so. Thanks for the piece on USDCNY and USDJPY. The little jest about China devaluing just in time to stay the Fed's hand may yet prove to be prophetic, MM. LB is back on the right hand side of the pond and enjoying the cooler weather of an English August after a truly disgusting stretch of humidity in the Big Apple (I know, just take the month off, I say it every year). We have been waiting for the (partial?) unwind of the two major carry trades of the year that have driven the EM FX and commodity/equity markets to this point. The current focus on a more hawkish Fed has given USD some wings and is prompting the early stages of what may prove to be a substantial unwind of USD carry trades. (Don't believe me? 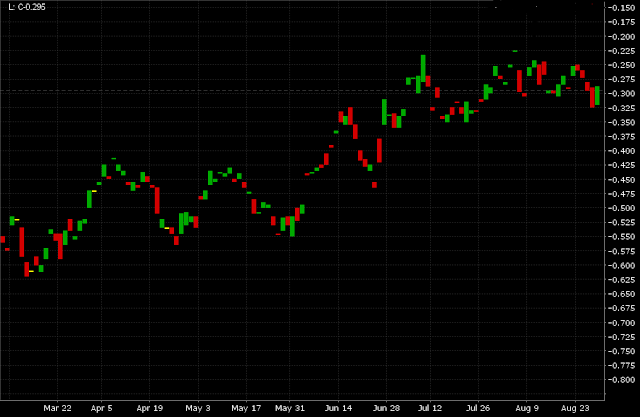 Then take a gander at the GDX chart, almost always the first domino to fall). But if I was an equity bull, it's the other (larger) carry trade unwind I would be afraid of. In other words, as we have said many times here, when a strong dollar surge is followed by substantial yen strength (e.g. what we witnessed in January), then those who are long risky assets will really have to watch out. We are still long dollars (short AUD, CAD and EUR) and short GDX, silver and crude here. We are also short the long bond, but we would expect that trade to get closed out in the next few trading sessions after the reaction to the US jobs number/s (ADP then NFP) plays out. Equities are always the last to get the message, especially when the message is macro - and lately that is one of the languages that equity punters think they don't need to learn. Tuesday's bounce came on one of the lowest volume days in living memory. Draw your own conclusions. The bingo caller is on the way. We are going with 205k for ADP and then a "blockbuster" NFP of 240k, which will be enough to maintain the Fed's narrative regarding September. Eyes down…. this one really "matters", guys. The wages data on Friday is likely to be the critical component, at least if we are to believe what we are told about Yellen's favorite data points. As far as the pessimists peddling low numbers, the initial claims data for the month are hard to square with a weak labor market. It will be an interesting day….